Our veggie garden has been a bit of a bust so far this year. I tried to use some of last year's seeds for onions and carrots which so far has not produced any sprouts. But we have also planted beans, more onions and lettuce and are hoping that those will sprout in the next day or two. To make us feel better today we filled all of our pots with beautiful flowers! The girls got to pick out (some) of the flowers without any guidance or coaching from us so we got some that I wasn't expecting but it has lead to very interesting and fun pots around the house. The girls got to help with all the planting and filling of pots. We were very excited this year to fill our pots with soil from our own compost bin! No store bought potting soil for us this year. We did occassionally get a few egg shells in our pots which the girls thought was hilarious. After all the plants were potted then came their favorite part...the watering! We are in the middle of yard sale/garage sale madness at this house! Five families have dropped off stuff at my house to be sold Thursday through Saturday. The kids (mine plus three other friends) will have a lemonade and cookie stand too! But in the midst of pricing, organizing, and setting up to sell all of our junk, I mean slightly used wonderful stuff, we had to do some planting. First off I just wanted to ask if any gardeners have ever seen Rhubarb that looks this THIS! Should I harvest it? Is it suppose to flower like that? What do I do with those really long stalks? Any advice you have on harvesting rhubarb would be AWESOME! Please leave a comment. Today we planted yellow onions, romaine lettuce, yellow beans and bush beans. The girls had a great time taking turns to plant with their dad. Our method for having the girls help is to hand them a few seeds and then we point to where the seed should go and they put it in. Once all the seeds are planted we work together to push the soil back over the seeds. I imagine this is a pretty common way of having little kids plant row crops. Sam, at age 4, is already pretty good at handling the smaller seeds (carrots, onions, etc.) but Avery is just on her first planting year to be involved so she just helped with the bigger bean seeds. Beans are, in my opinion, some of the best plants to grow with young kids. The seeds are big and easy to handle. The seeds sprout fairly quickly so that they don't have to be patient for too long. The beans are easy to pick off and a great immediate snack in the yard. My girls both loved helping to pick the beans last year and I know this year they will get just as into the process. To see a list of other great plants to grow with your little ones head over here. And be sure to check out the book "Roots, Shoots, Buckets and Boots" by Sharon Lovejoy. 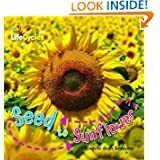 It is an awesome resource for gardening with kids. How is your gardening going so far this year? And WHAT do I do with my rhubarb?! We planted five tomato plants today. We only want one or two but we are starting with some seeds that were left over from last year so I am not sure that any of them will sprout. Here are the litle seed planting pods before we "planted" the seeds and watered them. You simply drop the seed in the hole in the middle and then water them. After a few minutes they swelled up and were ready to sit in front of a bright window! The girls will check them daily I am sure to see if the seeds have sprouted. We are probably starting these a bit early but I kind of failed last year at starting the tomato plants indoors. Not many of them were strong enough to withstand the wind once they got outside. So I am trying to give us plenty of cushion time to sprout more if we need to and to get these little plants nice and big before they go outside. Do you start seeds indoors? Would love to hear about your process! We are preparing for gardening season! WOOHOO!! That makes me happy just to say that. I cannot wait to be digging in the soil, planting seeds and then many months from now helping Sam fill her bucket full of produce and yummy fresh stuff for us to eat. I just love being in the garden with my girls. But for now we do some indoor activities to get us ready. First we are reading a book we just found at the library. Super silly, but who knew there were so many vegetables! I put some serious enthusiasm in my voice when I read this book, like I am doing a cheer at a football game, and the girls think it is hilarious. Plus, we have been able to look at all the pictures of things we could grow and talk about what we have room for and which ones we really want to try to grow this year. 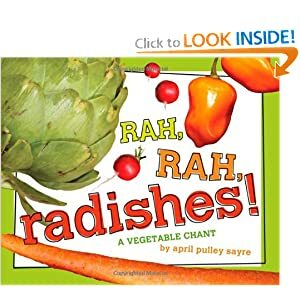 If you are feeling the need to discover some new veggies in your meals using this book to introduce them to your kids might be a good idea. Then Sam got busy making her own garden! Gotta love the Jung Seed catalog (any plant or seed catalog would work). I let her pick out which plants she wanted to put in her garden and where she wanted to put them. Great cutting and glueing work for her. Are you starting to think about gardening yet? How do you get your kids involved? This is the second year we have done this project. Last year she picked the food she wanted based only on color and this year she was much more focused on what foods she actually likes to eat. I love seeing the change and growth in her. This is a project that can easy grow and change with the age of your child. With much older kids you can have them actually look at seed packets to determine how much growing space certain things need. Then they can do the math problems to really figure out the best way to use your garden area to grow the most food. And letting kids have a say in the food you grow is always an awesome idea! Or if you have the space give them a section that they can plan out entirely and then take care of throughout the whole season! I think I was just saying the other day that winter was hanging on BUT at the same time spring seems to be trying to come! Avery and I found this the other day. It seems that the warm spot right up against our house is ready for spring! And it is WAY to early for that. I know there will be more freezes and more snow. To make sure that these flowers still look beautiful when spring is actually suppose to come I decided to cover up the flower a bit. We dug some soil out of our composter, raked back the mulch around the flowers and added the compost around the little leaves. Avery and I tackled this project while Sam was at school. Avery loved digging in the dirt and helping me to find all the little sprouting leaves. I don't think she understood exactly what we were doing but she had fun anyway! Then these books might be of interest to you! I was in the plants and seeds non-fiction section of the library the other day and found these three books that intrigued me. 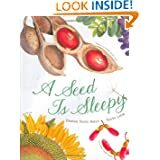 If you are in your growing season still or heading into it these might be good ones to check out for your little ones or your classroom. 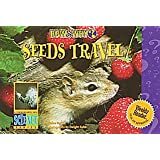 Read any good seed or plant books lately from the non-fiction section? What seed activities do you have posts about? Leave a comment I would love to read them!